Melbars Tröpfelhandel historischer Händler,Zelte, Tents, Blankwaffen, Rüstungen, BögenAre you a camper who thinks that campingin the wilderness is too tough and too uncomfortable? in the wilderness is too tough and too uncomfortable? - The winter lavvu life is looked upon as a comfortable surprise for new winter campers. - Those who have some experience with army tents are impressed how easy the lavvus are to put up. 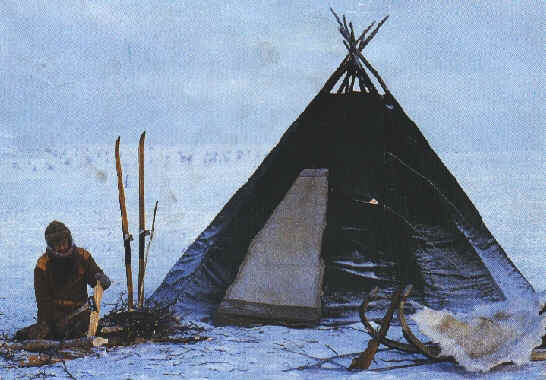 Old Sami traditions are carried on with modern materials and design. You therefore have the real guarantee of a happy lavvu life, at all seasons. It will be quite a new experience for you whether you are a professional or a lover of outdoor life enjoying the mountain hiking from time to time. also available accessories, It tells you which of our lavvu models suits your need and your way of outdoor life. We also work on a research programme to make improvements on the lavvu. Because of this there may be minor changes and improvements that have been made between the publication of the cathalogue and your order. If that is the case, you will get full information about changes when your order is received, With every cathalogue a special price list is enclosed. Ordering can be done either by mail or by telephone, Every buyer will receive an introduction on traditions and usages of the lavvu, free.